A thousand years of grief. 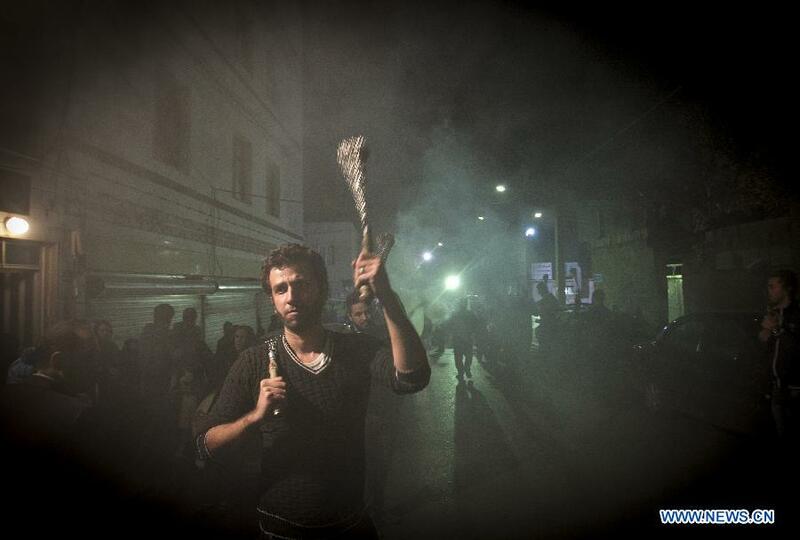 Photo: a Muharram procession in Tehran. Source here. I finished The Persian Boy in the courtyard of my guesthouse in Shiraz. For the last ten pages, I was crying pretty openly, while my tea got cold. Later Mohamad told me that his friends at the next table were shocked; but he knew me, and told them to just let me be. It couldn’t be helped. I’ve been in love with Alexander—and especially Renault’s creation of Alexander—since I first read The Persian Boy when I was seventeen. But at seventeen, I hadn’t yet seen death. Now I have. And my mother died in a very similar way to Alexander, over a period of days, moving back and forth between this world and the next, with the many changes of breathing, first shallow and rattling, then sharp inhales, then deep sighs, and then, nothing more. Outside the guesthouse, the funeral drums beat all night. It’s Muharram in Iran now, the ten-day commemoration of the death of the third imam Hossein and his family—including his six-month-old son—at the Battle of Karbala in 680 AD. During the day, you can see the funeral trappings parked by the side of the street—cages threaded with flowers and lights, banners of a baby wrapped in green, pennants colored black, with Farsi writing in neon pink and orange—and at night, men take up the enormous alam’ha, which resemble giant menorahs, each weighing four hundred kilograms, and carry them on their shoulders down the street with the funeral parade, only a minute at a time, with a retinue of spotters; followed by the drummers beating full moons, and the grids of men in black turning ninety degrees with every boom, lashing their backs with zanjir. The marches bring the entire city to a halt, stretching for ten kilometers or more. From the courtyard it sounded like a great black caterpillar of noise, drums and lamentations rippling up and down the city, sounding like ten tapes played backwards on a psychedelic Beatles track. I went back to my room and messaged a friend in Pakistan. We wondered at so much grief for someone so long dead, and the specific burden carried by those who traced their lineage back to that family, and what the martyrs themselves would think of these displays of grief for their sake. But then I thought of my mother, thirteen years dead; and of Alexander, two thousand years dead, and how hard I cried for them, and I know it’s not for their sake at all.